Jack Paterson of Polytechnic Harriers won the Scottish Marathon in 1949 and 1951 with Harry Howard of Shettleston winning the race in 1950. 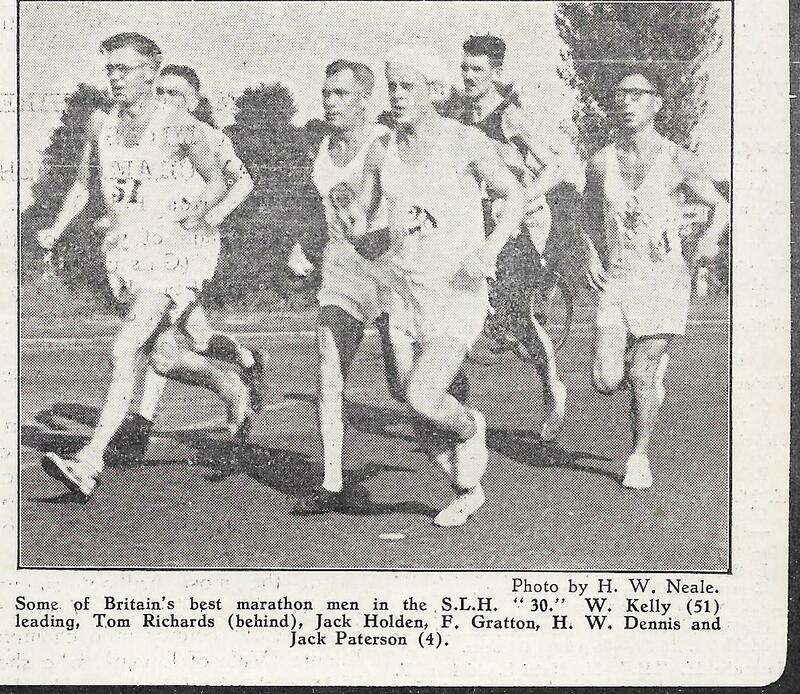 Jack was also one of the Scottish Marathon representatives at the Empire Games in Auckland in February 1950. Shorter than most of his contemporaries, and bespectacled he looked quite an inoffensive chap but his competitive record tells a different story. 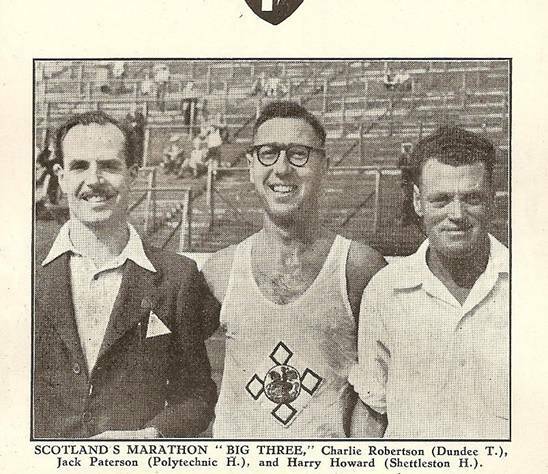 The men of the 1950’s – other than Joe McGhee – are probably the least well known of all Scottish marathon champions and yet their place in the sport is significant. Jack Paterson, Harry Howard and Hugo Fox all trained differently, all were looking for their own route to marathon success. They were also the last of the generation that believed marathon success was the preserve of the older, more experienced athlete. Jack lived in Tooting, South London, only started running at the age of 28 and began taking it seriously at the age of 32. His first marathon was the classic Poly Marathon on 18th June 1949 from Windsor to Chiswick and he finished fourth in 2:50:36. This was followed up with his first victory in the SAAA Marathon on July 1949, on a very hot (not arm but hot! ), over the difficult Gourock to Ibrox trail. How he came to enter in the first place is described in the ‘Scots Athlete’ article below. ‘A Hardy Race’ describes his feat thus: “the winner was 36 year old Jack Paterson from Polytechnic Harriers, who had been an excellent fourth in the famous Poly Marathon earlier in the year …. after establishing what looked like a winning lead, Charlie Robertson the holder had to retire from the race with blisters and Paterson defeated McDonald by only four seconds (2:57:07 to 2:57:11). “This after he had nursed and advised me for the last sixteen miles of the race. Truly a great sportsman and the gamest of runners. The AAA’s championships on 30th July at Birmingham was won by Jack Holden from Tom Richards with Ballard third, and Paterson’s sixth in 2:45:02 was a very good run. His second marathon success was when he won the Liverpool Marathon on 13th August where he registered a time of 2:51:55. It was back up to Scotland on 3rd September for the Marathon at Edinburgh Highland Games. He won again, this time in 2:46:04. Not content with five marathons since June, he ran in the South London Harriers 30 miles road race at Coulsdon on 4th September where on another very warm afternoon, he finished second – seven minutes behind Jack Holden but only one second ahead of Fred Gratton with Tom Richards back in sixth. His splits on the four lap course were 48:11; 45:55; 49:25; 55:21. The cumulative effect of all this racing and his victory in the SAAA Championships saw him selected for the Empire Games to be held in Auckland, New Zealand in February 1950. The selection prompted this account of Jack’s career was in an article in ‘The Scots Athlete’. One of Scotland’s athletic team of seven selected to represent Scotland at the Empire Games to be held in Auckland, New Zealand, next February, Jack Paterson will toe the line for the most classical event – the marathon. And yet to practically every Scottish student he was unheard of until a blistering hot day in July of this year when he won the National title contested over the Gourock – Ibrox course. His selection was not just assured by becoming the newly crowned champion but was obviously made by the stern consistency he was later to show and a revelation of his ‘potential’. Let’s retreat a little to note his ancestry. His father who hailed from Clackmannan and his mother who came from Alloa took the southbound trail about 1902 and about twelve years later Jack was born in Tooting, London. Thus on second January 1952 he will be 36 years of age. His running career began about eight years ago when he was in Egypt. he ran in 3, 6 and 10 mile races but in his own words ‘was never better than mediocre’. Still, he kept fit and as soon as he returned to England in February 1948 he turned to long distance road racing. He confesses he had much to learn. He was twenty sixth in the Finchley 20, 65th in the Poly marathon, and third from last in the South London 30. Certainly not an imposing record but the fact that he finished in the Poly marathon and the 30 in his first marathon season gives an insight into his grim determination. (3) I heard a broadcast by Maureen Gardner in which she revealed that she trained five times a week throughout the winter no matter what the weather was like. When the track season came around she said she found that all this work she had done paid dividends. I decided to train five or six days a week and the pace of the run was never more than a slow jog-trot. 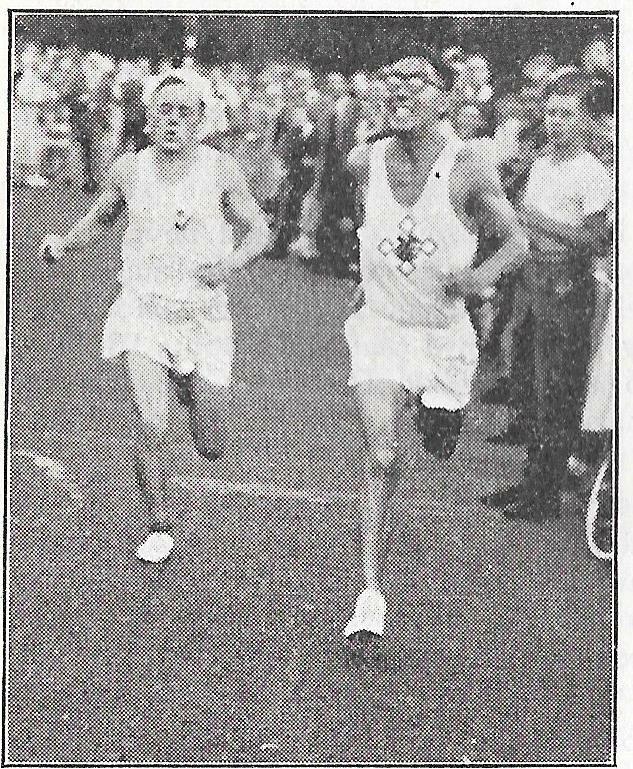 Starting with six miles a day at the beginning of October I gradually increased the distance until I was doing 17 or 18 miles a day by the following summer.’ In the 1949 Poly Marathon won by Jack Holden he finished fourth. He had worked long and built well. From 65th to 4th in a season certainly registered progress! Start of the 1951 Empire Games Marathon: Paterson marked with cross. Number 137 is Arthur Lydiard and Jack Holden is on Paterson’s left. In the event, hard as he tried he could not emulate the successes of Dunky or Donald. He travelled out to New Zealand with the other British teams by steamer. This took a month and his form suffered from the long drawn out journey. The ‘old head’ of Jack Holden saw him fly out by plane and this paid off when it came to the race. Paterson? On a very hot day he finished fourteenth and last of the finishers in a good field. The race was won by Jack Holden of England in a pb of 2:32:57: Holden demonstrated how tough he was when at the age of 43, he ‘kicked his broken shoes off at 16 miles and ran the last ten miles in his socks; he had a further adventure three miles from home when he was attacked and slightly bitten by a Great Dane dog.’ He nevertheless finished ‘fresh but with badly cut and blistered feet’! Interestingly enough, with the benefit of hindsight, the fourteenth finisher was Arthur Lydiard of New Zealand in 2:54:51 who was, of course, to go on to become one of the greatest distance running coaches the world has seen, and who, indirectly, helped Scot Mike Ryan to a bronze in the Mexico Olympics in 1960. He was back in action in Scotland for two marathons in 1950. The national championships on 8th July over the Falkirk to Edinburgh trail and finished sixth in 2:57:01, and the Edinburgh Highland Games marathon on 2nd September where he finished eighth in 3:02:22. The Scots Athlete ranked Scottish Road Runners at the end of the summer and Paterson was ranked in eighth position behind Harry Howard, Charlie Robertson, Emmet Farrell, Willie Gallacher, Andy Arbuckle, Jim Lindsay and Harry Haughie. It had not been his best season, but he was to be back again in 1951 with another championship title. He started 1951 on 26th March at Sheffield where he was fourth in 2:41:39 and followed this up a month later (21st April) in the Finchley 20 at Ruislip, finishing ninth in 1:57:30. The times in these races would indicate that he was running well despite the positions: the Sheffield marathon for instance was faster than any of the races of 1950 which gained him qualification for the Empire Games. 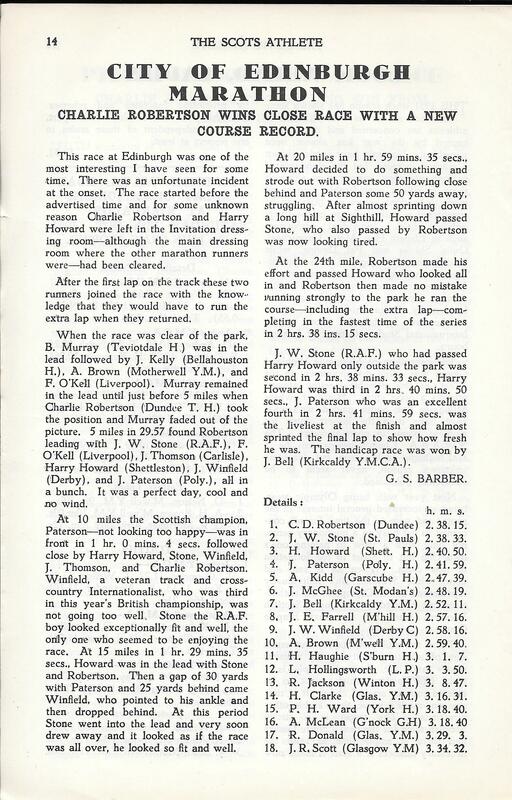 “Held with the SAAA Track and Field Championships for the first time, the 1951 Scottish marathon, from Symington to Hampden Park on June 23rd was very humid and a number of the more prominent runners had to drop out due to heat exhaustion, including the extrovert Willie Gallacher (Vale of Leven) who was notable for having his own coach and publicist. Other casualties were JE Farrell and Alex McLean (Greenock Glenpark Harriers) . Gordon Porteous ended up fifth. One notable phenomenon is that Gordon’s time was 2:51:11 just 2 seconds faster than his superb run in a marathon years later in the 1975 Scottish marathon – a deterioration of one second a year! Jack Paterson would have enjoyed that statistic – Emmet remembers him as having a prodigious memory for times and facts about running. Later on in 1951 Paterson turned out in the Edinburgh Marathon where he finished fourth and the race was reported in ‘The Scots Athlete’. Lots of interesting and well known names in there but none more interesting than Jimmy Scott in eighteenth place, almost an hour behind the winner: Jimmy would go on to be the Secretary of the Scottish Marathon Club that did so much for the sport in Scotland. He returned for the Scottish marathon on 9th August, 1952, over the Perth to Dundee course but could only finish fourth and out of the medals in in 2:41:21. Charlie Robertson won this one by only 25 seconds from Jock Duffy with Emmet Farrell third with Joe McGhee in fifth position. That was a good run – the time shows that but his career in the Scottish championships was over. He was now 36 years old and there were so many very good and aggressive young runners coming along- on both sides of the Border – that he probably felt it was time to say good-bye to top-flight athletics.